F.I.R.S.T. (For Inspiration and Recognition in Society and Technology) Robotics is an annual challenge of technical wits among students and their robots. Hardin Valley Academy, a Knoxville, Tennessee-based high school, is headquarters to the RoHAWKtics team. Each year this team pushes their technical abilities further and further. This year, the team wanted to experiment by including additive manufacturing into their designs. Competition robots endure grueling challenges as they navigate with and against challengers through physical obstacles, bumps and crashes. Last year, Hardin Valley harnessed 3D print technology, but this year’s performance-based competition required the robots to utilize materials which contained higher flexural and stiffness properties than available through 3D printed materials. 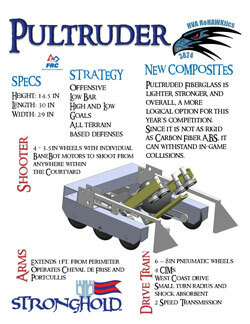 Within six weeks after its completion, PULTRUDER endured the F.I.R.S.T. Robotics Smoky Mountain Regional competition, a three day event designed for teams to protect, infiltrate and defend towers in a game of “F.I.R.S.T. Stronghold.” Hardin Valley and PULTRUDED took first place in this competition for the second year in a row. The team then went on to the world championships in St. Louis to compete against 599 other teams in the “F.I.R.S.T. Stronghold” challenge. During one round, Hardin Valley’s team threatened the record for most number of points scored in a single game. Ultimately, the RoHAWKtics and members of their alliance lost in the last day of competition as they were eliminated in the best-of-three playoff challenge. Click here to view their Youtube channel.